Press Release - Tropic Air, The Airline of Belize – March 8, 2016 - Tropic Air, The Airline of Belize, has announced the February results of its ongoing nationwide #TropicGivesBack charitable fundraising campaign. For every ticket bought at the month’s selected station, $1 will be donated to an organization chosen by our staff stationed in that community. In January, $500 was donated to the Dangriga Red Cross. February was the chosen month for Caye Caulker, with Belmopan scheduled for March and San Ignacio coming in April. 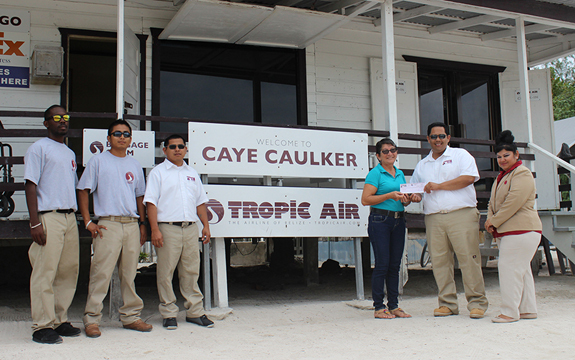 As part of the airline's largest charitable fundraiser of the year, Tropic Air business partners, staff and customers joined efforts and raised $400 for “Arms of Love”, a Caye Caulker cancer support group. Sergio Marin, Caye Caulker Station Manager and his Staff presented a check to Ms. Enelda Rosado from “Arms of Love” on Thursday, March 3rd. "Our love of People and Community is our most powerful fuel, which is why we have a long history of helping through nonprofit support. We are committed to giving back not just nationally, but in the Communities where our Customers and Employees live and work" said John Greif III, Tropic Air’s President. “Through the #TropicGivesBack Donation program, we hope to spark social, economic, and environmental initiatives in Communities across the country. We would like thank our Employees for their efforts in volunteering around Belize, and we thank our Customers for supporting this program” said Steve Schulte, Tropic Air CEO. Founded in 1979 by John Greif with just a single airplane and two employees, Tropic has steadily grown to become the largest and most experienced airline in Belize. It now employs over 320 staff, offers over 200 daily scheduled flights to 18 destinations in Belize, Mexico, Honduras and Guatemala. Tropic believes in giving back. It supports the development of the communities its serves through health, sports, drug prevention, education and community projects. Tropic also supports the development and growth of the wider tourism industry of Belize through promotional initiatives locally and internationally. The Caye Caulker cancer group “Arms of Love” is a non-profit organization whose aim is to assist those in need of medical attention and care related to cancer. It serves the Caye Caulker community not only through medical assistance and support, but through emotional support initiatives as well.